← International Food Blogger Conference, Here I Come! For me, one of the highlights of the 2013 International Food Blogger Conference this past weekend was the Saturday night surprise supper hosted by Urbanspoon. 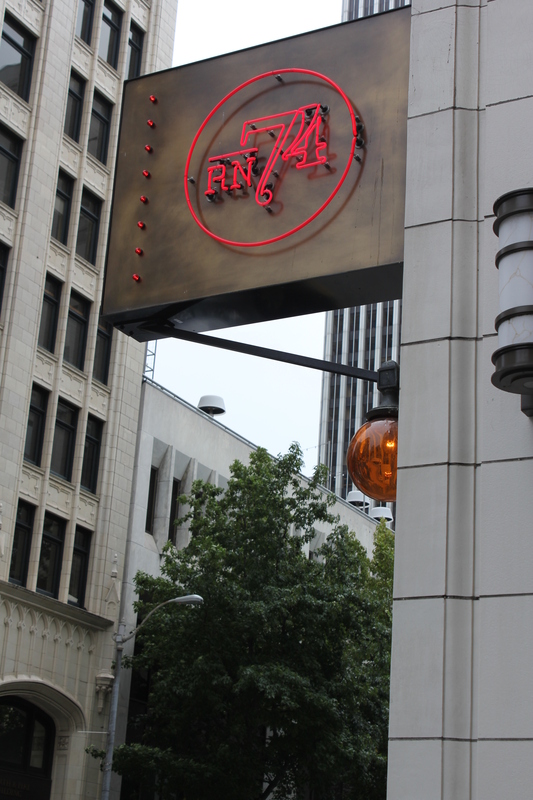 I was quite lucky to get to eat at Michael Mina’s RN74 (1433 Fourth Avenue at Pike Street, Seattle, Wash. 98101). According to its website, “the cuisine at RN74 aims to be a perfect complement to the wines — creative, modern, but simple interpretations of regional French cuisine punctuated with seasonal, fresh ingredients and bold flavors, all executed with a signature original twist. 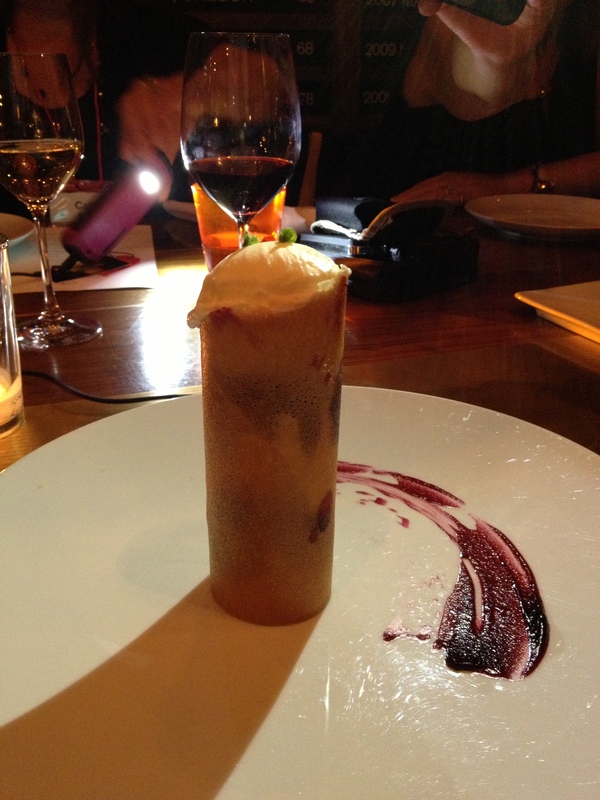 Recently, OpenTable.com diners voted RN74 Seattle onto the 2012 OpenTable Diners’ Choice lists.” I can see why. 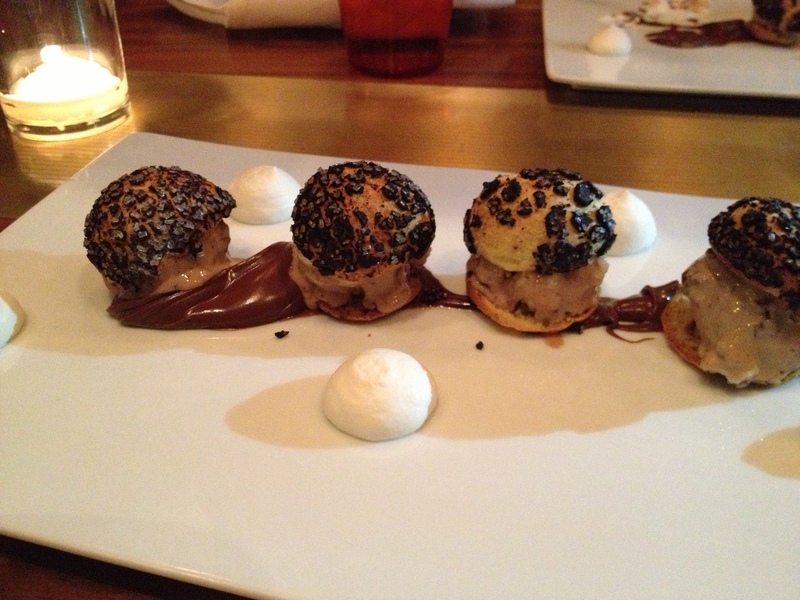 Our tasting menu consisted of three courses: Appetizers, main entrees and dessert. 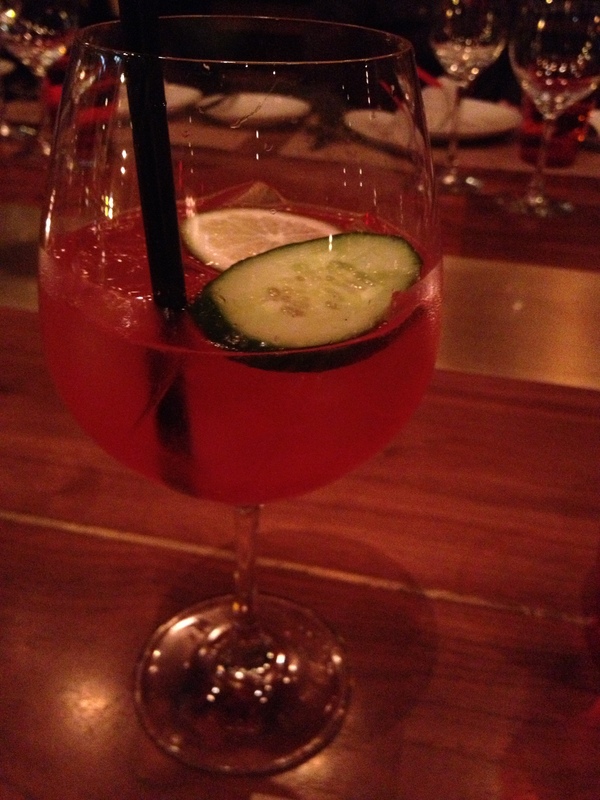 These were served with a gin-based mixed drink called the House Spirits Swizzle, and red and white wines. 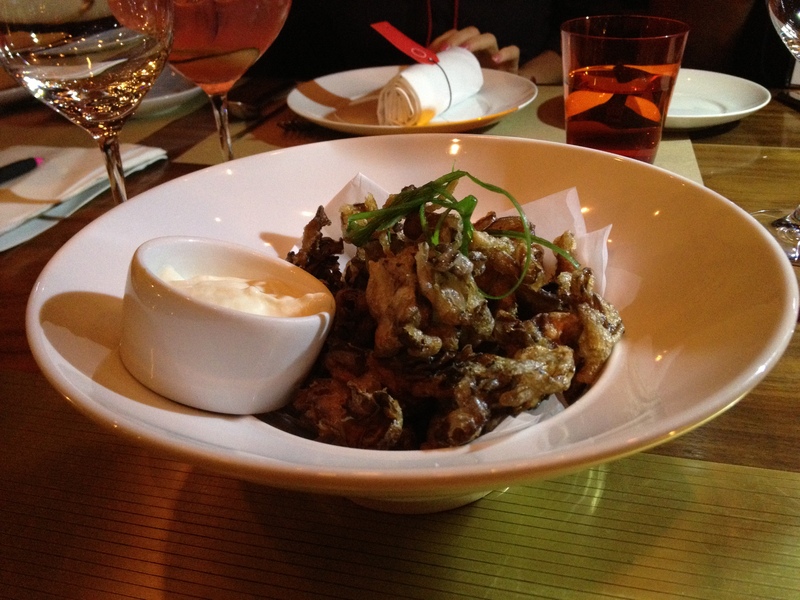 The mushroom tempura was fantastic! Earthy and crunchy at the same time. The Epoisses crêpes were filled with ooey, gooey cheese. 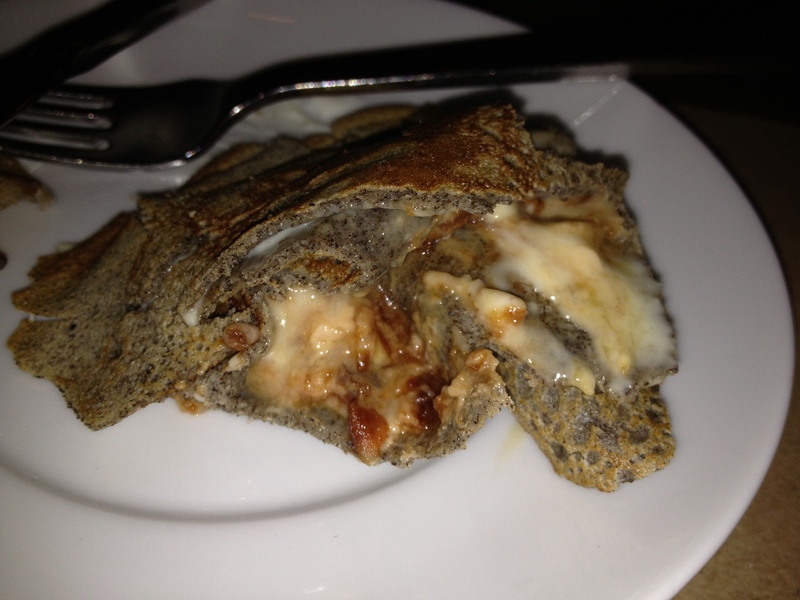 I was okay with the buckwheat crêpes, I guess, but probably would have liked it better with more traditional crêpes. 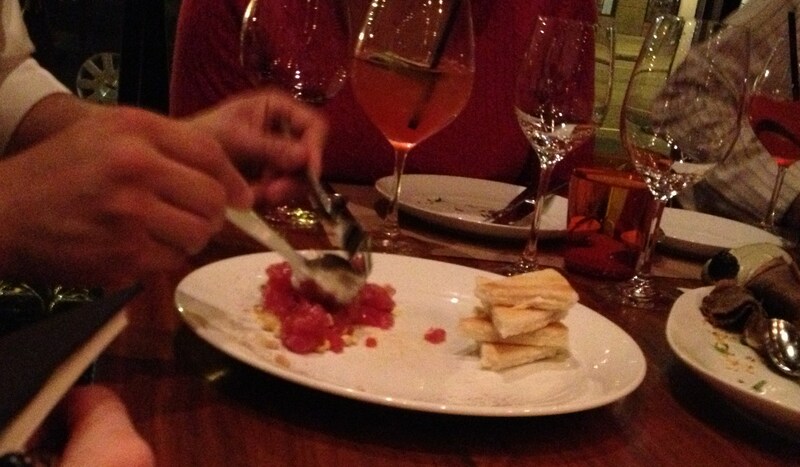 The Ahi tuna tartare was out of this world! They chopped the tuna and mixed it with the other ingredients at the table. It was oh, so fresh. Last came the tomato soup fondue with Emmenthaler cheese croutons. 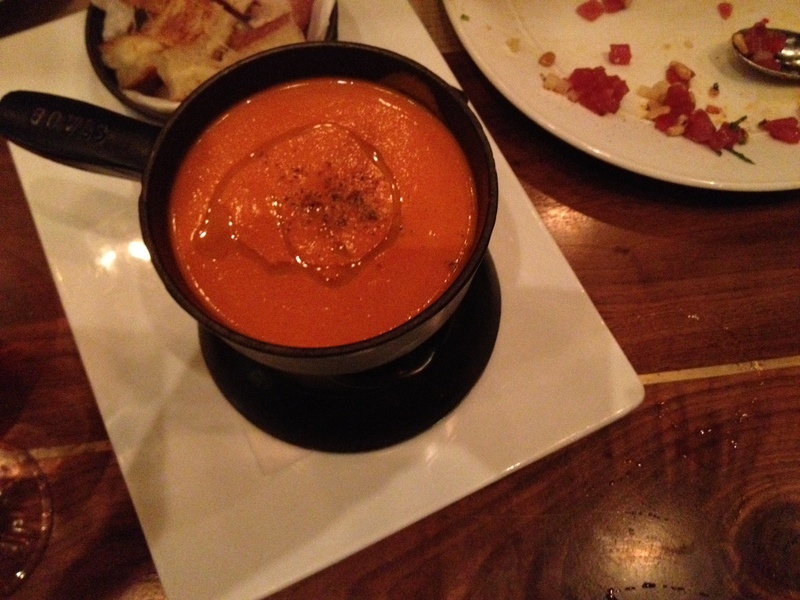 Total comfort food – the croutons were excellent and the soup was creamy and perfectly seasoned. I need to make this at home! 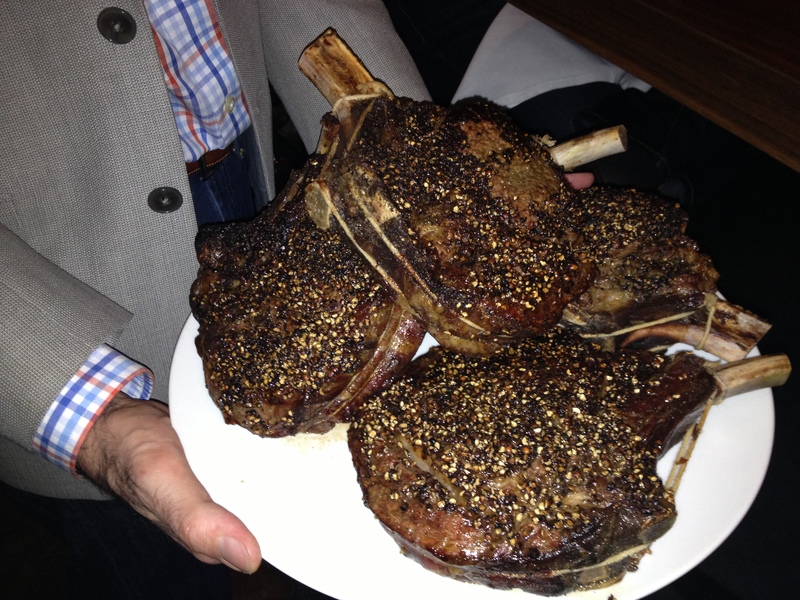 The beef was excellent – I loved the poivre (Brad would have, too!) Perfectly cooked and seasoned. I didn’t try the garlic frites but heard they were good. 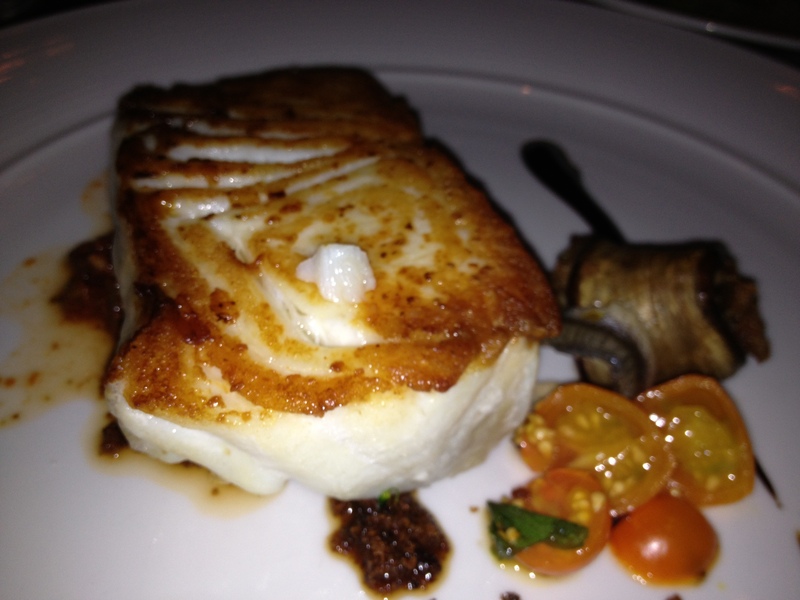 The halibut was tasty – nice and flaky with great flavors and seared to perfection. I only tried a bite of the crab spaghetti, which was rich and creamy, and none of the salmon because I wanted to save room for desserts. And I’m glad I did! The third course started with Crunchy Chocolate Profiteroles (rocky road ice cream, Nutella) and ended with Croustillant (olive oil cake, lemon curd sherbet, huckleberry compote.) I’m still not sure which was my favorite – they both rocked! 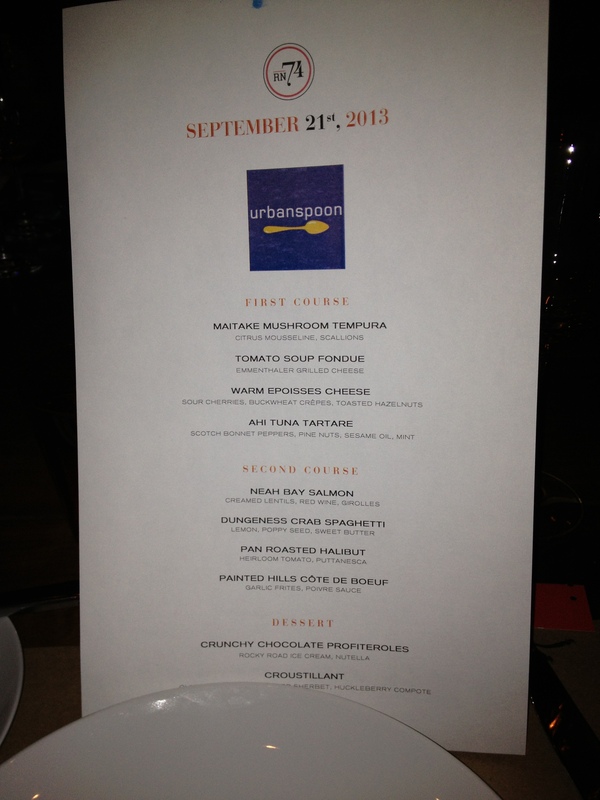 Thanks IFBC and Urbanspoon for arranging such a great Saturday night! 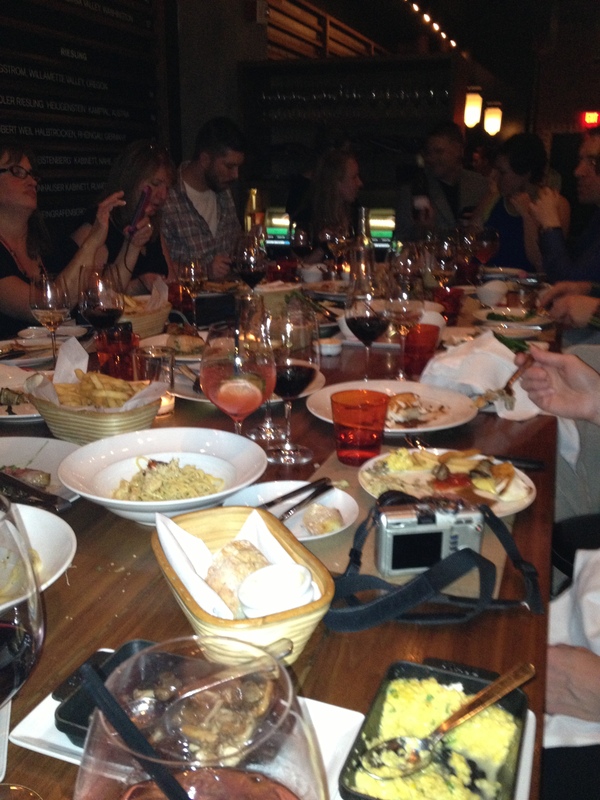 Not only did I get to sample some awesome food, but I also got to meet some great bloggers as well. This entry was posted in Restaurant Reviews, Tools of the Trade and tagged eat drink and be merry, IFBC Seattle 2013, International Food Blogger Conference 2013 Seattle, Kel's Cafe restaurant reviews, Michael Mina restaurants, Michael Mina's RN74, RN74 Seattle Wash, Urbanspoon hosted IFBC dinner Seattle. Bookmark the permalink. There’s a special kind of magic that happens at the best restaurants, when everything comes together—charming service, scintillating company, great ambiance, flattering lighting (outstanding food is a must, of course)—and we walk out feeling as if dinner was worth every penny spent, even when we cringe a little the next day thinking about exactly how many pennies we spent. So true, and so very well put, Roman.